Prime Minister Narendra Modi has launched the Pradhan Mantri Ujjwala Yojana in Uttar Pradesh’s Ballia.Pradhan Mantri Ujjwala Yojana is an NDA government scheme that aims to provide 5 crore free cooking (LPG) connections to below-poverty-line families over the next three years. Providing LPG connections to BPL households will ensure universal coverage of cooking gas in the country, claims the government. “This measure will empower women and protect their health. It will reduce drudgery and the time spent on cooking. It will also provide employment for rural youth in the supply chain of cooking gas,” the government says. The scheme provides a financial support of Rs 1,600 for each LPG connection to the BPL households. The identification of eligible BPL families will be made in consultation with the state governments and the Union Territories. 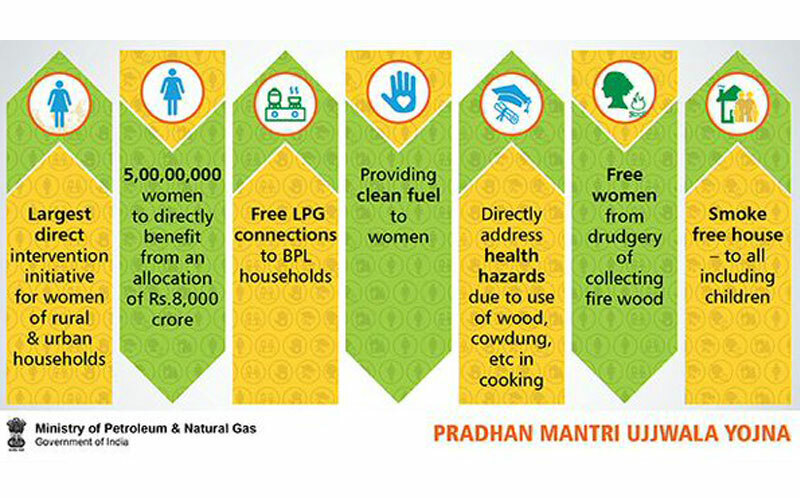 Finance Minister Arun Jaitley in his Budget 2016 speech had announced a budgetary provision of Rs 2000 crore for 2016-17 to provide deposit-free LPG connections to 1.5 crore women belonging to BPL families. The ambitious Rs 8,000 crore scheme will partly be funded using the money saved from 1.13 crore cooking gas users voluntarily giving up their subsidies through PM’s ‘Give It Up’ initiative. Nearly Rs 5,000 crore of subsidy saved through the campaign is being used to provide LPG connection to the poor.